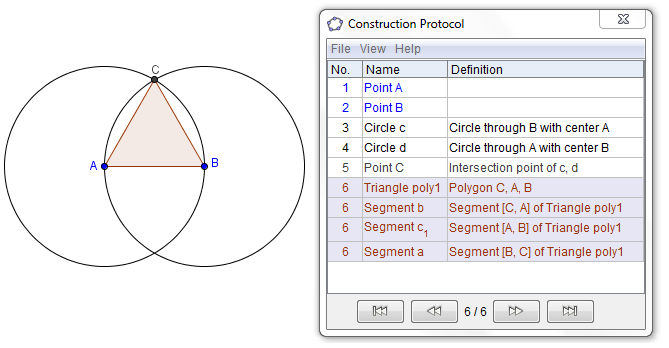 When a geometric drawing or construction is done in GeoGebra, the steps are recorded in the Construction Protocol. The Construction Protocol contains the steps of how geometric constructions are made. This way, other users of the GGB file would be able to examine the steps and repeat the construction. Another use for the Construction Protocol is when checking if a particular construction made used the required steps or if they are mathematically correct. For instance, students may construct equilateral triangles using the Regular polygon tool instead of the using two circles (see figure above) to mimic compass and straightedge construction. The Construction Protocol can be displayed by using the View menu. The arrows can be used to display graphically how a construction is made. While using the arrow, the construction is reconstructed and the corresponding steps are highlighted.